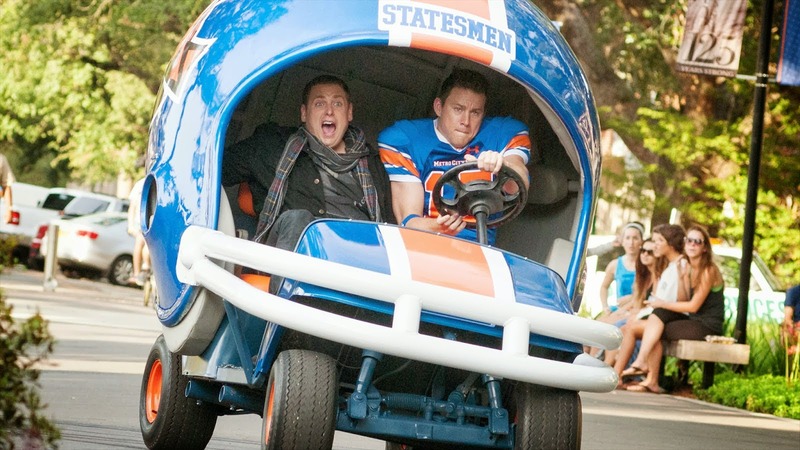 In all honesty, I wasn't the biggest fan of the original 21 Jump Street, and that goes for the original show as well as the first comedy remake. The show was always cheesy, but the movie was just a bit too self referential and meta for its own good, winking too often at the camera, and even worse, relying way too much on improvised dialogue hinging on the overrated charisma of its two stars. Overrated is actually a good word for it, not terrible, just not nearly as funny or well written as it was purported to be. 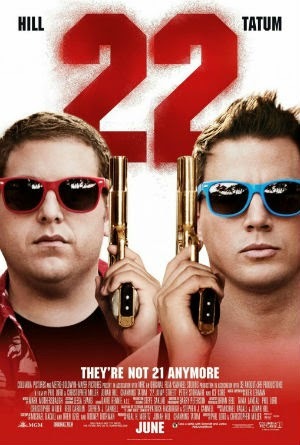 The new sequel only places greater emphasis on many of the qualities that put me off about the first one, and yet paradoxically, the result is much more entertaining. 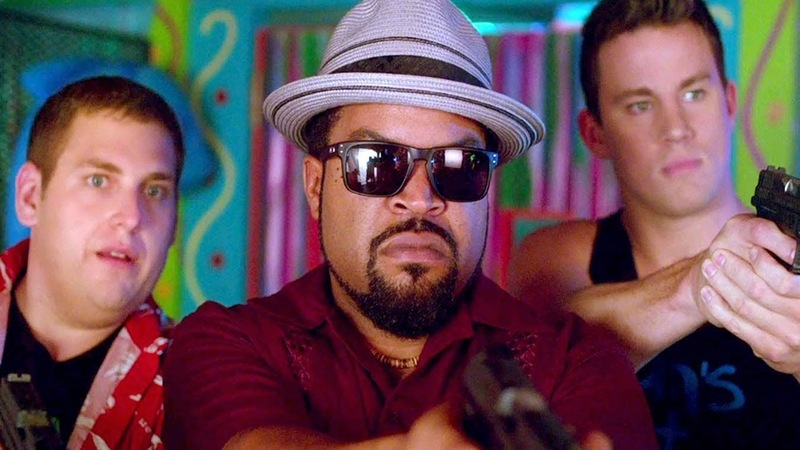 22 Jump Street finds the odd couple undercover cops from the first movie graduating to an assignment in college, where we are reminded incessantly that they will be expected to do the same exact thing they did last time, so as to get the same result that everybody liked. Get it? 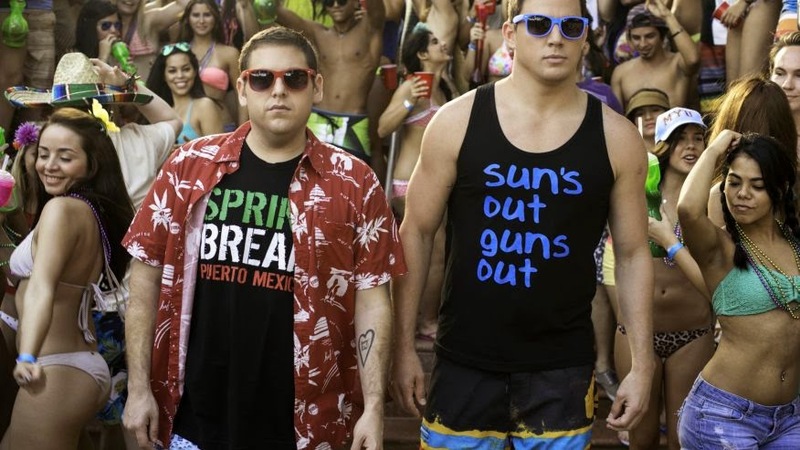 They’re in a sequel, and their real life goals are proxies for the goals of the film itself. Sorry, I know it ruins a joke when you explain it, but the problem with meta humor is that you almost explain the joke as you tell it, and the more obvious it is (extremely so in this case), the more condescending it comes across. It can be done right, but once you get to the point where a character literally has a red herring tattoo (a joke I’m pretty sure they stole from A Pup Named Scooby Doo), you know you’re not exactly in Dan Harmon territory. And yet, the increased reliance on meta jokes turns out to be a double edged sword, as it seems to have forced the writing process to be a little more disciplined. Apart from an opening scene of the guys just voguing for the camera, it doesn't seem like they’re just goofing off and making things up as they go along. The structure is a little more clear, the set ups and payoffs more well constructed and as a result more satisfying. 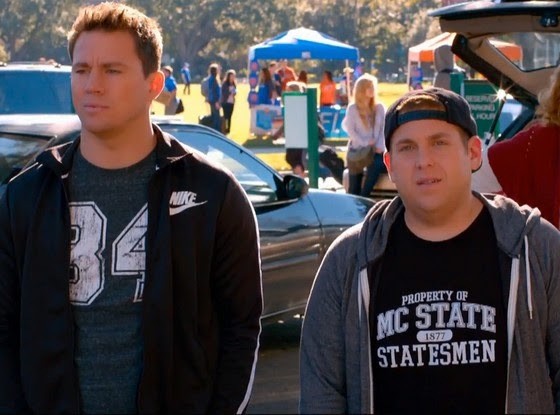 I actually get the sense that someone wrote this movie, and then the thing they wrote was valued in some way beyond a template for Jonah Hill’s nebbishy riffing and whatever Channing Tatum is doing that he thinks is comedy. In short, I don’t feel like I’m being insulted by off the cuff laziness, so its easier to get in the right mood to laugh along with a dumb comedy like this. All around, the setting and expanded cast of characters is superior to the original. A friend and fellow critic who actually enjoyed the first film was disappointed that once the pair got to college there wasn’t a role reversal twist as in the original, but for me, that never really added much to the original, and having the nerdy guy fit in with the nerds and the jock fit in with the jocks just streamlines the whole thing and gets us past a story element that really isn't all that important anyway. Peter Stormare might not be as well utilized as Rob Riggle (who still gets a cameo), but Jillian Bell’s deadpan roommate is easily an improvement on Dave Franco, even if he is by far the superior Franco.